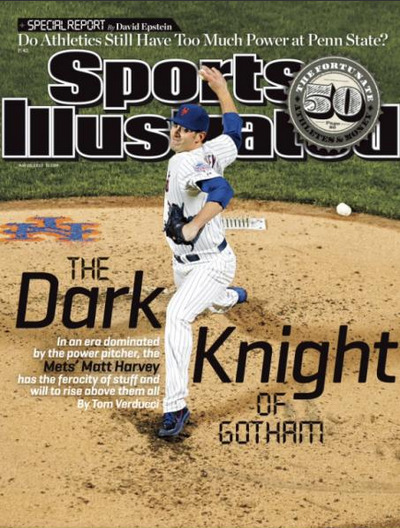 Twilight Language: Dark Knight of Gotham: Sports Illustrated Curse? Making the cover of Sports Illustrated is sometimes called a curse. How do you think it might feel to be on the cover and be called The Dark Knight of Gotham? 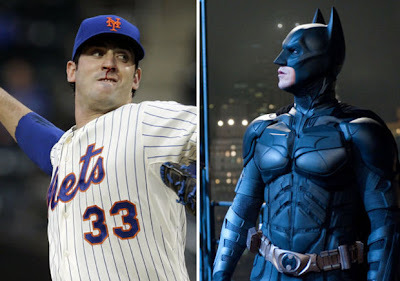 Major League Baseball pitcher for the Mets, Matt Harvey, may be pondering that very fate. He's on the cover of the May 20th issue. Matthew Edward Harvey was born (March 27, 1989) in New London, Connecticut and grew up in Mystic, Connecticut. He played during his youth for Fitch Senior High School in Groton, Connecticut and the University of North Carolina at Chapel Hill. Harvey is an National League MLB right-handed pitcher for the New York Mets, debuting with them on July 26, 2012. The Staten Island Advocate even published Harvey and Batman next to each other so the comparison would not be lost on its readership. And by doing that, all could clearly see that Harvey's jersey number is 33. 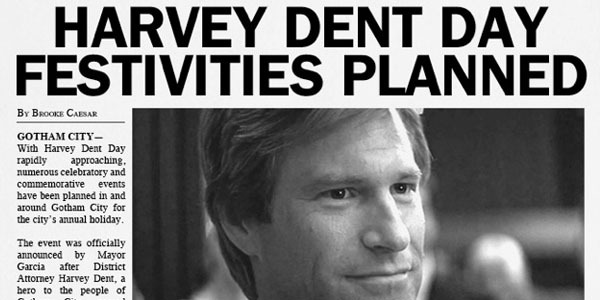 Also, don't forget, Harvey Dent was a major character in the second Dark Knight film. The name Harvey is of Old English and Old French origin, and derived from the Breton name Haerviu, rooted in the elements haer "battle" and vy "worthy," literally "battle worthy," or in some views, "eager for battle; strong and worthy." The Sports Illustrated cover curse or jinx is an urban legend that states that individuals or teams who appear on the cover of the Sports Illustrated magazine will subsequently be jinxed or experience bad luck. See here for a long list of incidents causing some to feel the curse has been confirmed. Aaron Eckhart was born March 12, 1968 and moved to (old) London when he was 13 before moving to Sydney,Australia to complete his last year at high school,before moving to New York to find work as an actor. Eckhart's birth year 68 upside-down you get 89,Harvey's birth year.
" Star Trek Into Darkness "
" The immortal "Ides of March" Denarius coin, struck by MARCUS Junius Brutus in 42 B.C. to celebrate the assassination of Julius Caesar, realized $546,250, the most ever paid at auction for a Roman silver coin, at the Heritage September Long Beach World and Ancient Coins Auction." Notice the (baseball ?) cap of freedom surrounded by two daggers on it ?